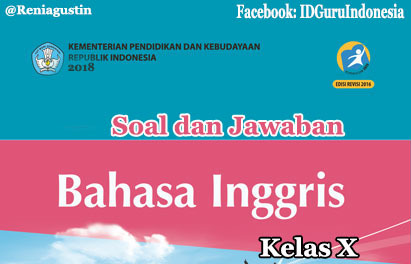 Salam Pendidikan Guru Indonesia, Kali ini kami bagikan contoh soal dan jawaban / pembahasan Bahasa Inggris kelas X, semoga dapat membantu rekan-rekan guru yang sedang membutuhkan. Berikut ini soal dan Jawaban Bahasa Inggris kelas X.
Soal Bahasa Inggris Kelas X. Not being able to sleep,Iwan sat up in bed peering into the darkness. Suddenly he felt a current of cold air. He jumped out of bed. However, having forgotten the motion of the ship, he was instantly thrown violently across the room. With difficulty he got up and groped his was towards the window which, to his surprise, he found wide open, for he was certain that he had fastened it securely before he went to bed. Choose the right statement ! 1. The story tells us about…. 2. Why did Iwan Jump out of bed and try to get to the window ? 3. Which of the following did not frigten Iwan ? 4. Which of the following statements is true according to the text ? 11. Which sentence is correct ? a. Do you watch every Thursday evening the English program on television ? b. Do you watch on television the English program every Thursday evening ? c. Do you watch the English program every Thursday evening on television ? d. Do you watch the English program on television every Thursday evening ? e. Every Thursday evening do you watch the English program on television ? That’s not true, I certainly……. 21. As Rian left an hour ago, he should have arrived by now.